Boasting up to 6400 dpi with Optical Density of 4.0 Dmax for film scanning and enhanced by an energy-efficient ReadyScan LED technology, you can expect images refined in brilliant resolutions, with zero warm-up time. Bring out exquisite quality from your photo or film with the Dual Lens System, capable of resolutions up to 6400 dpi* with an Optical Density of 4.0 Dmax for film scanning and 4800 dpi for reflective scanning. Combined with Epson Matrix CCD™, you can enjoy brilliant details from your scans, making it perfect for your work or hobby. *Film scanning using the film holder. Equipped with film holders for 35mm strip film or mounted film, 6 x 20cm medium format film, 4” x 5” large format film and a film area guide for scanning up to 8” x 10” transparency, experience versatility and ease in your scans. The new film holders are equipped with Anti-Newton Ring glass** to maintain film flatness and have up to 5 height adjustment levels to achieve the sharpest scans. **Except for the 35mm mounted film holder. The Perfection V800 Photo is equipped with energy-saving and eco-friendly ReadyScan LED light sources that require zero warm-up time, providing hyper-responsive scanning. The V800 is Energy Star® certified, with a power-saving sleep mode that reduces energy consumption even further. Push the limits of your editing potential with a software bundle of scanning and imaging tools that let you create the images you want. Copy photos and documents easily without a copy machine or an all-in-one printer. 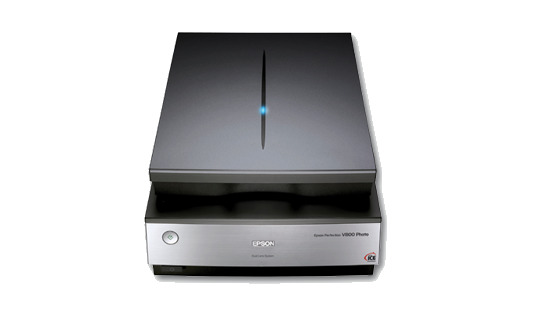 Epson Copy Utility easily combines your Epson Scanner and Printer into a copy machine. Make regular scan jobs easier by creating ten customisable jobs. Users can also assign a job to the scanner button for one touch scanning. This professional scan and imaging software includes functions like dust and scratch reduction and noise elimination for professional results. The Epson Scan driver provides a user-friendly software interface that caters to your every need. A fully automatic scanning function gets new users off and running and professionals will enjoy the suite of advanced tools to get the best scan results. Restore the original colours of faded photos to make them look as good as new again.